Get Your Summer On at Shoppers Drug Mart. Win a $100 Gift Card! Summer is upon us! With the long cold Winter that we just endured, warmer weather is certainly something I will be welcoming with a t-shirt, shorts, and sandals! It’s the time of year I most look forward to… cleaning off the patio furniture, cleaning off the deck, taking the cover off the #SilvaBulletRV, and planning for the summer. With so much to do to get ready for summer, it truly is a family effort. Lots of planning goes into making sure everything is done in time to enjoy the summer together. Our summer bucket list includes a lot of quality time together as a family. We have a Jamaican vacation planned, and several days of camping in the #SilvaBulletRV. Going away on vacation requires a lot of planning. Booking time off work, organizing a kennel stay for our dog, preparing a packing list, and purchasing things that we need that we do not currently have. We recently took a trip to Shoppers Drug Mart to buy some of the items on our summer shopping list. … and stocked up on Olay moisturizer, deodorant, and sunscreen. She’s trying out the Sunthera3 line from Life Brand. … and Sun Bum SPF 50 face cream. She loves that Sun Bum comes in a small size, so she can carry it with her. Everyone has their own favourite sunscreen in our family! … and Crayola sidewalk chalk – because every sidewalk needs to be colourful! Oh, and Chips Ahoy! Thins… just because! and Lauren remembered to buy Excel White Bubblemint chewing gum for Wendy – it’s her favourite! We were able to get everything we needed from Shoppers Drug Mart, including some sidewalk chalk for Lauren (which she put right to work). It was a successful shopping trip! We still have a few clothing items to pick up, but for the most part, we are done. It feels good to cross things off our summer shopping list. Now here is your chance to do the same. Win prizes at Shoppers Drug Mart! 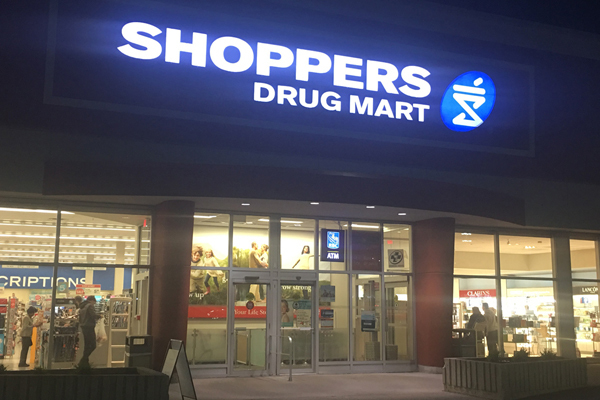 $100 Shoppers Drug Mart Gift Card Giveaway! The folks at Shoppers Drug Mart have graciously given me a $100 Gift Card to give away to 1 of the lucky readers of my blog. That’ll buy a lot of items off your summer shopping list! To qualify for the contest, you must click through to the Giveaway Tools widget and follow the instructions. You must comment on the post after clicking through (mandatory). Each additional task completed gives you more entries! Be sure to include your email address where prompted to qualify. It’s that simple. A name will be drawn (via Giveaway Tools) on June 26th, 2017 (after 1pm EST). Disclaimer: I am helping to promote Shoppers Drug Mart’s “Summer On” campaign. All opinions are my own. I definitely need to pick up sunscreen, waterproof mascara and allergy medication. I will be picking up summer essentials for my hair that gets so dry & frizzy in the heat. I want a deep conditioning hair mask & a Conair Infiniti hair straightener! I want to pick up some sunscreen, sand toys, snacks, beach towel and sunglasses! I need to pick up some sunscreen and some body lotion. I will be picking up sunscreen, new makeup, vitamins, snacks, groceries among other things. I will be picking up sunscreen, facial moisturizer with SPF, antihistamine and squirt guns for my grandson. Yay –we’re looking forward to summer weather when it comes! :) I’ll need to shop for Sunscreen Kids & a sport version for my summer running, plus beach toys and snacks. Always extra kiddies with us when school is out. . :) And, I cannot forget …. a good book for the beach! Shoppers Drug Mart has a fantastic selection! Bug spray is top of my list for an upcoming camping trip, but I know that I’ll end up hitting that snack aisle! Note: There are 2 FeedBurner Subscription entries, but when you click to subscribe they are deactivated. I need to pick up sunscreen, lip chap, a summery perfume and mints for road trips. I need to pick up sunscreen and some snacks. I need bug spray, sunscreen, anti-histamine and some Aloe! I need to pick up sunscreen, moisturizer and some supplies for my first aid kit. Sunglasses, sun tan lotion, Pepto, Gravol, towels. beach toys and Ice cream ! For summer I need to pick up some supplies like marshmallows, chocolate and graham crackers to make s’mores. Also some ice cream and popsicles would be great too! I need to pick up some sunscreen , body lotion and allergy med! I need to pick up some sunscreen, some bubbles, and some outdoor toys for the kids to play with. And some new sunglasses. I need to get sunscreen,aloe and bug spray. I need to pick up more sunblock! Oh and bug spray. The kids are off to camp in a few weeks!!! I need to pick up Bandaids. I need to pick up sunscreen,bug repellant and snacks,of course!! I need to pick up sunscreen, bug repellent, some magazines and of course Freezies!! I need to get sunscreen snacks, and vitamins for the summer! I need 60 spf sunscreen, burts bees lip balms and insect repellent. I need to pick up some suntan lotion! I definitely need sunscreen, sunglasses, a hat, and some drinks. I need to pick up some sunscreen, lip balm, bug spray and bandaids….oh and some snacks for camping! I pickup Sunscreen at Shoppers! I would buy some sunscreen, pool toys, snacks and drinks! We could always use some summer snacks here and sunscreen. I love that watergun idea, my kids would be happy. I’d like a new pair of sunglasses too..mine are on it’s last legs. On my to-buy list is waterproof sunscreen, after sun lotion, and hand sanitizer! I have to pick up some sunscreen, aloe, snack and drinks. For summer I need sunscreen – lotion & lip balms. Also need new sunglasses. I need to pick up some sunscreen. aloe lotion, bug spray and allergy medication. I have just discovered moisturizer that has SPF instead of sunscreen. I dont know if its worth it yet, but i need some more.. im getting older! I definitely need to pick up a new beach bag/tote, a refillable water bottle, face sunscreen, and wet wipes. I would definitely need to pick up some sunscreen and water! We need antiperspirant, after sun lotion, hair ties, and sunglasses. I need to get bandaids, sunscreen, and so much more for a fun and safe summer. Will be picking up some bottled drinks and snacks. I also need to pick up some Hydroscortisone Cream to put on all those itchy bug bites. I need to pick up some sunscreen, insect repellent, and one of those plastic popsicle makers so I can make some frozen yogurt and fruit pop. I need to pick up Sunscreen, Lip Balm and Vitamins.. I love using my Optimum Points at shoppers. I need some bug spray! I need to get some sunscreen and bug dope. We also always need snacks for the house too. Shoppersdrug is my fave shop for lotions, soaps, vitamins, biscuits and most of all some beauty products. I need sunscreen , bug spray , some flip flops and beach toys ! I will need to pick up some mosquito bite sticks. I’ll be going to Shoppers for sunscreen, bugspray, snacks and a pair of sunglasses! I would buy some water toys for my grandchildren to enjoy at the lake. I need sunscreen, fly spray and lots of snacks. Need lots of sunscreen and water. sunscreen, sunglasses, first aid items. Well, we should replace the sunscreen and also get some popsicles/freezees! I need to pick up some body lotion and paper products for the road trips. I could use some bug spray and suncreen! I need to get sunscreen, snacks and magazines! I need to pick up some mosquito repellent for the summer. I need to pick up sunscreen and bug repellent. Need to get some Benadryl to have on hand too for the summer, just in case. I need to pick up sunscreen, lip balm with sunscreen, and sun glasses. I just went in and picked up some snacks and a bunch of first aid items. I would pick up some bottled water at Shoppers Drug Mart for those warm days ahead. I gotta pick up from Shoppers some beach toys and some bug spray! I need to pick up sunscreen, bug spray, After Bite and some allergy medicine. I would pick up some sun glasses and sunscreen. I’d like to pick up some makeup with spf! Thanks for the post, loved to see the pictures! I need to pick up a new pair of sun glasses. I need to pick up some antihistamines! Stock up on mosquito repellent. I’ll be getting sunscreen and lip balm. I would pick up some snacks at Shopper’s Drugmart to enjoy while we sit outside in the sunshine. I like getting milk and eggs at Shoppers – great price. I need to get some sunscreen. Need to pick up all the items to make Smores for when we are camping! I need to go to Shoppers /SummerOn to pick up more sunscreen ,bug spray, and bandages for the summer. so many things I would pick up, such a sunscreen and after bite. so many things I would pick up, such as sunscreen and after bite. I need to add some Polysporin to my list for those cuts, scrapes, and burns. We need sunscreen and bug spray for when the are out and about. I’m getting low on bandages so I’ll need some of those, as well as aloe in case of sunburns. Bug spray! So allergic to mosquitoes! I surely need to pickup some sunscreen!! I need to pick up allergy meds., sunscreen and snacks. I could re-stock my first aid kit at Shoppers Drug Mart. After this past weekend I need to stock up on some After Bite, my ankles got ate! I need to pick up polysporin, bottled water and more sunscreen. I feel like we eat the sun screen in the summer. I definitely need some bug spray, and mosquito coils!! I need to pick up lots of snacks for the upcoming road trip. We need a new beach tent. We always need sunscreen, snacks and to have some pictures printed (of the kids) for my inlaws. Love Shoppers Drug Mart! Items I need to pick up for summer are snacks, lip balm and a couple of novels. I’d get me some shades. I need to pick up some sunscreen at Shoppers. Need to pick up some allergy meds for hubby since Summer is his worst time of the year. Sunscreen is on my list! I need to add some gravol to list. Can’t travel without it. I need to pick up some sun screen – and road trip snacks like chips and nuts! We need to pick up sunscreen, chairs, new cooler and some camping gear. My go to store for ALL things summer is SDM! I am going to have a girls’ weekend with some school friends and I have picked up sunscreen and travel size products like toothpaste,deoderant,and make up remover. I need to stock up on sidewalk chalk and bubbles! I need to pick up some sun screen and some water float toys in preparation for 3 weeks at gramma’s house. I need some sunscreen for the kids and fly spray and also some bubble bath would be awesome! Thanks! I need to pickup sunscreen and lip balm with sunscreen. I need to pick up some vitamins. I’ll be getting shampoo and conditioner, and magazines. I need to pick up a pair of shades and some magazines so I have something to read while sitting out on the deck and maybe some gummy bears to munch on as well!! I need so many things! Sunscreen, charcoal mask, new eye liner, vitamins! I could go crazy in SDM with all the great items they carry! Aloe Vera Gel for those Sunburns! Will need after bite after all this rain. I need to pick up sunscreen, Tylenol, juice, and snacks. Need some sunscreen before we head to camp. I need some sunscreen for the summer! I like to get ear plugs at Shoppers Drug Mart. I need to pick up some can pop and bottled water. I need to pick up sunscreen. Need to get to Shopper to buy more gummy vitamins. I want to pick up some snacks at Shoppers for the next movie night I have with my grandchildren. I need to pick up some magazines – great for a beach read. I need to pick up suntan lotion and after sun lotion for those hot sunny summer days! I have to get some lip balm. I need to pick up some suncreen and eye cream. I should really stock up on some aloe for my inevitable burns. I need to pick up some sunscreen, moisturizer, hair color and face cream. I’m still stocked up on sunscreen, but could use some insect repellent and snacks. sunscreen, topping up first aid kit, and a couple of good books. I need to pick up lots of sunscreen, and snacks for the beach! Need to pick up some lip balm with spf to help protect my lips while outside. I will need to grab sunscreen and bug spray for summer. I will need to pick up a new summery perfume! Love Shoppers & their Optimum programme. I can treat myself to extras, after shopping for essentials !! Sorry – meant fourth box from the bottom. I really need sunscreen hopefully for when the sun comes out. I need to pick up a moisturizer that has a sunscreen in it. I need some sunscreen that work’s for scalp and hair. I need to get sunscreen,lemonade & sweet & salty popcorn. I need to pick up lots of sunscreen for the summer. I’m pretty sure I have everything now except lots of ice cream. I need sun screen and some new shorts and tops. Some chips, probably other snacks, and sunscreen. I need sunscreen and bug spray. I also need to pick up a few drinks to keep me hydrated. We need some sunscreen, sunglasses, lip balm with SPF and some snacks! I need to grab the fixings for smores! I like to go to Shoppers to pick up a few quick things like bread and milk. I need to pick up picnic basket items such as napkins. I need sunscreen, bug spray, allergy medication and Lotion. I’ll need to pick up sunscreen and aloe lotion. I need to pick up some sunscreen for my face. I would pick up sunscreen and bug spray. For summer, I need to pick up sunscreen, a light tinted moisturizer and lots of bottled water. I’ll need to pick up ice cream when the heat hits. I need to pick up bug spray & stuff to make smores! Would be nice to keep vitamin stocks up! I need to pick up some cracker and cheese for the road trips. I need to pick up bug spray and goodies for camping trips. SDM has a perpetual revolving door for me during the summer; I am in and out all the time picking up deodorant, sun screen, water bottles, snacks and treats for picnics and days out, first aid supplies, over the counter meds (for headaches), perfume, etc. etc. I am there throughout the summer, loading up on essentials! Need to pick up a few new ice packs to have on hand just in case of any summer injuries. Water balloon and other weaponry! I would get some soft drinks. Pain reliever and shaving products. Man, are they pricey!!! I want to purchase bathroom products like soap and laundry detergent. Some cat food for my cat, ice cream for me, and snacks. Definitely need to get sunscreen. I need to grab some bug spray and sunscreen first! I will need to pick up some bug spray at Shoppers. I need to pick up some Tylenol for summer headaches. I’ll need to pick up sunblock and aloe and summer makeup! I would like to pick up some patio lanterns from Shoppers so we can enjoy our yard even on late summer nights. We need to pickup some sunscreen and hubby needs new face cream. I need to restock for Summer with new sunscreen, bug spray and popsicles. I would pick up some outdoor toys for my kids. So HOT!!! I better get some deodorant!!! I only need to get some ice cream. *** link is STORM instagram follow is NOT working!! I need tissues & allergy meds !! I would get sunscreen, hats and sunglasses for my 3 kids, exema cream, sandals, bug spray etc. Thanks for the chance. I’ll be picking up spray on sunscreen an razors for sure. I need to pick up some sunscreen… We use tons during the summer!! I need sunscreen, lip balm and snacks. I need some face creams and lipstick. Well let’s be honest Shoppers has a great range of items so I would buy many many things. I love their Optimum Points Rewars program too. Always worth it for me to shop there. First I’d load up on Tassimo T Discs then bug spray for the kid’s camps. Then I would get more laundry detergent and maybe check out beauty supplies as well. We often need more shampoos and conditioners and things like that as well they have a great supply of multivitamins – so I would load up on Vitamin C and things like that. Summer colds are a drag so best to battle them early with more vitamin C. Thanks for the chance to win. They carry canes and walkers don’t they? I need to pick up sunscreen just noticed that ours expired 2 years ago..yikes! I need to pick up some new Quo eyeliner, a daily moisturizing facial sunscreen and some spray on sunscreen for the kiddos! I’m hoping there will be lots of wild blueberries to pick this year, so I’m going to need lots of sunscreen and bug spray. I always need to re-up on sunscreen. Some garden decorations would be great as well! I need to get some lip balm for all the pockets for summer. I will definitely be needing some sunscreen this year! I need to pick up some sunscreen and instant tan…. I need to pick up Sunscreen, Hawaiian Tropic after sun, popsicles, bug spray and things to make s’mores!! I need a beach towel, a hat, and some shades! I need to pick up some sunscreen and some bug spray! I need to pickup some waterproof makeup for the beach! I need sunscreen and bug spray! Necessities of summer for me. Potato chips, granola bars and juice boxes for a start! Sunscreen, benedryl, snacks, hair products, nail polish, plastic drinking cups & drinks is on my summer get it on shopping list!! I need some waterproof makeup for the summer so that it doesn’t run in the heat. i need alot of sunscreen. I walk daily and work in the garden. I need to use it alot due to having radiation treatment. Sunscreen is really needed here. I need some new sunglasses and maybe a book to read and of course sunscreen. I need to go to Shopper for some of their great sales this week like: deodorant, shampoo, toothpaste, vitamins, JuJubes and Coke. Some books to read while camping. I need to pick up some sunscreen for the summer. I need to pick up some new reading glasses at Shoppers so I can enjoy the sunshine while reading some books. I’ll need bug spray and anti-itch lotion! We love Neutrogena sunscreen, bottled water, and they do have an awesome kid’s toy selection! Sunscreen, snacks, drinks and magazines. I would stock up on summer skin care essentials for the family. Sunscreen for adults and kids is top of the list, moisturizer, shampoo/conditioner, bug repellant.,first aid kit for car refilled. That could change Shoppers has some great deals. .
Definitely some sunscreen and mosquito repellant and for sure some snacks for the beach trips. I need to get some icepacks for lunches. Sorry that was my comment. I need to pick up some icepacks for lunches. I need to add some wipes and paper towel to the list. Sunscreen, sunscreen and more sunscreen. Also bug spray, swim diapers, water, some fun toys and snacks. I shop at Shopper’s at lot! Sunscreen and waterproof mascara are must-haves! I need to pick up some coke and chips for a summer party! We need to pick up insect repellent and sunscreen. I may as well stock up on aloe since I know I will burn. I have a sunburn so i need sunscreen. I need to pick up facial tissue and allergy medication. All this pollen! Definitely need more sunscreen for me and my pale kids! Sunscreen & bandaids for all the family to enjoy an active outdoor summer. I need to pick up some good quality sunscreen lotion, as well as a bottle of ASA, Tylenol, and Voltaren Emugel. My granddaughter is coming to visit this summer and she is allergic to peanuts so I need to pick up some peanut free snacks for her at Shoppers. I’ll be getting stocked up on ice cream to keep cool. I love to pick up new, spring or summer perfume at SD when the season changes. I need to get some more sunscreen as am running low and a hat. I’ll need to get earplugs and bottled water. I need to pick up some magazines, bottled water, freezies, and a pair of shades! I like when peanut butter is on sale! This week I need milk. I need to pick up Tylenol and after sun lotion, for any days that are a bit too long in the sun. I need to pick up ingredients for smores! Sunscreen and some good deep conditioner for my hair! Love Shoppers, I’ve been an Optimum member for the past 10 months and been able to redeem over $600 in points. I’ll be stocking up on sunscreen and bug spray along with my usual bread, milk, eggs, and TP. I need to get some dry shampoo to freshen my hair when camping. Would get some socks, sunscreen, and snacks. I can never leave Shoppers Drug Mart without some new lip gloss, body lotion, energy bars and some chocolate! As always come summer, it’s ice cream. Gravol is another item that is one the list to pick up just in case for motion sickness. I need to pick up some water flavour enhancer at Shoppers so I will drink more water over the summer and not get dehydrated. I will need to pick up some snacks for the coming weekend. It’s going to be too hot to cook ! I would pick up sunscreen, Off and allergy meds. I need to pick up some shampoo and conditioner for summer from Shoppers. Ice cream is on the list. I need to buy replacement sunscreen products. I just noticed that a couple of ours have expired. I also need some mosquito repellent for the evenings by the fire. Thanks for the great giveaway opportunity. I need to pick up some bug spray for summer. I just discovered I need to run to shoppers and get some new razors. Need to pick up some new razors. I need to pick up bottled water, paper plates, and paper towels. I will have to grab some icecream for the hot summer weather! I need some sunglasses, sunscreen and shampoo. Sunscreen, bug spray and lotion! Sunscreen, lip balm and snacks are on my list. Definitely ice cream…it helps cool me off. Need to pick up some sunscreen, bug spray and snacks for camping. I need sunscreen, body wash, hand soap and several different kinds of makeup. I need to pick up after bite and bug spray. I need to pick up a couple of magazines for something to read on the beach. I will be needing some great cooling summer drinks for days when I am out working in the garden. I need bubbles, sunscreen and lots of snacks for summer! I would buy some milk, they always have it on sales and extra bonus point! Need to pick up some new nail polish for the summer! My answer is: lots of ice cream! I need to pick up some popsicles. I buy all my snacks and sun screen. A good book for me, and some beach toys for the kids! I need sunscreen, bug spray, a moisturizing body wash and snacks for the cottage! The item I would need to pick up would be ice cream to keep cool. I need to pick up new shampoo and conditioner, something that will be good for my hair after being in the ocean. Every time the temperature spikes, my kitchen gets over run with ants. Need to go & get some Raid products to combat them. I’ll be stocking up on vitamins. I would pick up some sunscreen, a new pair of sunglasses and bug spray. Sunscreen, insect repellent and After-Bite are on my list. I need to pick up some polysporin. I need to pick up some bread and tuna for sandwiches for the road. I will need to get crackers, yougurt, cheese and milk for afternoon snacks. In the nearest time I’ll only need ice cream. Could use to pick up some snacks for summer road trips. I need to pick up bug spray, sunscreen, and moisturizing body wash! I see they have the LB/PC tissues on sale this week. Will need to pick up few boxes- allergies, ah !! I need to pick up some batteries at Shoppers for the bubble toys I got my grandchildren for when they visit this summer. I’ll be needing bottled water, juice, and pop. Need anti-allergy meds, and they do fabulous sushi! I need a new pair of sunglasses! I need to pick up some Aveeno face wipes and Biore Pore Strips from SDM. I need to pick up some nail polish and lipgloss. I need allergy stuff, unfortunately. Stock up on sunscreen and bug spray. I will be picking up som sunscfreen, and also some snacks for family activities. After spending a few days at Rondue and Point Pelee I need to stock up on more bug spray! I will need some Afterbite for when I get eaten alive by mosquitoes. Ice cream is a summer must have…helps on hot days. I need to get some treats for end-of-school party. I will be picking up the usual summer needs, sunblock, bug spray, Gillette Venus disposable razors! I need to pick up sunglasses and sunscreen. I need to pick up sunscreen and bug spray! I need to pick up some vitamins, because when we have a heatwave (as we are now), there is no way I eat enough, or properly. I need to pick up some sunscreen and a hat. I need to pick up a waterbottle, snacks, beach blanket and book! I need to pick up some picnic food at Shoppers. Some cheese, turkey slices, buns, chips, and cookies should be a good start. Lost of Bandaids and Polysporin! I need sunglasses, sunscreen and insect repellent. I’ll be picking up snack foods and body wash and toothpaste. I need a new baseball glove. mine can’t catch (but it did today!!!!!!!!!!!!!) I don’t think Shoppers has some. I need some shades. I need to pick up sunscreen, snacks, drinks, bug spray and paper towels! I need to pick up bug spray, allergy medication and lots of snacks.